Anatomy of a Dinner Party » Oysterfest! I just got this notice from my sweet friend Marsha and cannot wait to go! Usually I am very lazy about reading press releases (okay, about everything…)but this totally caught my eye. Oysters. Beer. The Four Seasons, y’all. If you wear a collar and don’t show up in flip flops, I bet they will serve you. I’m going. Eric does not share my love of oysters. Who’s going with me? 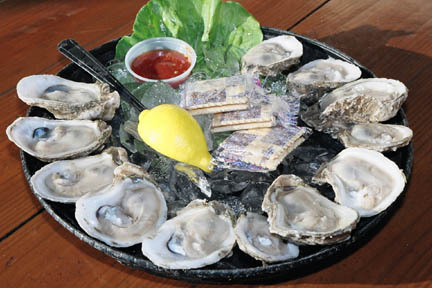 This special is sure to have you as happy as a…well, oyster! Available daily from 5 -7 p.m., Park 75 Lounge is featuring oysters from both coasts as well as a bevy of boozy specials. See the details below – and hurry in, Oysterfest ends January 31st! Draft beers: Fat Tire, Sweetwater 420 $5. Schramsberg blanc de blancs $15. Are you serious? When are you going? You know I have been craving oysters for so long! I am definitely in!! Lets make plans. Yum, Hood Canal. I know we should support “our” side of the ocean but I’m a west coast oyster gal when raw.